In the era of Agile, organizations are increasingly moving their IT service management teams toward a DevOps world. There are significant challenges to transforming ITSM to DevOps, but one of the most significant is goal setting. In today’s face-paced business environment, it’s important to establish the parameters for measuring success and determine objectives that meet business needs. Most experts recommend setting “realistic” or “achievable,” but try setting some crazy ones. While you might not achieve them, lofty goals create a culture where people feel safe to fail and understand that experimentation is essential to moving forward. After all, if you shoot for the moon and fail, you’re still among the stars. One of the best examples of risking failure to become great is Google. Before this search engine giant came on the scene, internet surfers relied on applications such as Ask Jeeves, Excite, and Lycos to find what they wanted on the web. Google co-founders Sergey Brin and Larry Page had a vision of better search results via machine learning and algorithms, but their early ideas were taking a long time to come to fruition. They almost gave up, but they reportedly declined a deal for a guaranteed million dollars and pursued their dream instead. Today, Google dwarfs all competitors. It purchased a risky, scrappy little company called YouTube in 2006, and the rest is history. Although Google may not have set out to dominate the search engine and online video worlds, they certainly weren’t settling for mediocrity. The ideals of aiming high and achieving beyond expectations hold true for DevOps teams as well. The common wisdom is to set goals that have the highest chances of being accomplished. After all, most people are adverse to wasting their time on tasks that only lead to failure. In truth, studies have found that setting “unrealistically” high goals actually raises the bar, increasing performance to expectation levels. Lofty goals also encourage team members to draw on their creativity, bringing more innovative results. These benefits go beyond DevOps, impacting sales, user experience, and financial outcomes. DevOps teams can lead the charge to success that can’t possibly be achieved with ordinary goals. The entire DevOps premise rests on transforming companies into agile, adaptable organizations that can keep pace in today’s ever-changing business IT environment. In ITSM team settings, releases are often discussed in terms of weeks. DevOps allows teams to work on a time scale of days, but what if companies set goals in hours? Focusing on continuous improvement and delivery is key here, but it’s not without risks. Buggy code and incompatibilities abound, but there are ways to decrease these pitfalls. First, break down any barriers or information silos that can hinder communication between various IT teams, as well as those that exist between the marketing, finance, and C-level departments. Stakeholders across the organization need to be accessible to ensure that everyone is on the same page and that they have mitigated all known risks for new releases. Automation is another important aspect. Being able to “set it and forget it” means DevOps teams can move on from each project quickly without worrying about deployment. This includes effective performance management tools that provide proactive alerts with detailed assessments of current or potential problems, allowing DevOps teams to discern exactly what the issue is and how to fix it — fast. Continuous improvement is an admirable goal, but complete transformations are better. Ultimately, the biggest risk of setting middling goals is a loss of potential. It’s imperative that DevOps teams take big chances, learn from their failures as well as their successes, and optimize risk management with the requisite tools. Organizations need to build an environment where DevOps are keen on experimentation, aren’t afraid to fail, and thrive on a cycle of constant adaptation. There is a place for realism, of course, but not in the sense of setting lower goals. Instead, be realistic about building the teams, processes, culture, and the technology infrastructures that can be conducive to success. 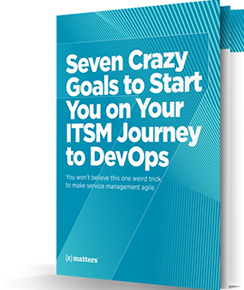 Rob England, an instructor of ITSM and DevOps practices and the IT Skeptic, recommends setting goal that might seem crazy to help ITSM organizations move into a DevOps world. You can read all seven on our website. As events unfold during a service outage or deployment, the hand-off from tool to tool and ill-defined communication processes slow organizations down. xMatters is a toolchain communication platform that relays data between systems while engaging the right people to resolve incidents. xMatters ensures that the appropriate individuals and groups for any situation are identified, notified and taking action. To close the loop, xMatters manages and drives forward the underlying workflow from originating systems. xMatters automates and brings structure to communication to help enterprises proactively prevent outages, manage incidents and keep the right people informed. Try xMatters free and find out for yourself.